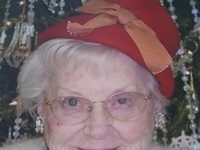 Myrtle Hickey, 93, of Thief River Falls, MN passed away on Sunday, January 20, 2019 at the Thief River Care Center. 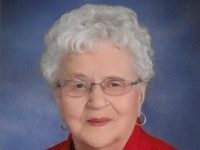 The service for Myrtle Hickey will be held at 2:00 PM on Saturday, January 26, 2019 at Johnson Funeral Service, Thief River Falls, MN, with Pastor Larry Myhrer officiating. 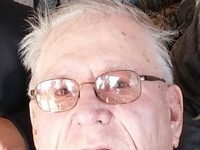 Visitation will be held one hour prior to the funeral and a lunch will follow. Myrtle Carol Nelson was born December 11, 1925 at Waterloo, IA, the daughter of Otto and Dagny (Jergenson) Nelson. Myrtle was baptized in the Lutheran faith in Waterloo, IA. As a young girl, she moved to Newfolden, MN with her family, where she was confirmed and attended school up to 8th grade. While working at a restaurant in Thief River Falls, MN, she met her future husband, Lester Rodahl. They purchased a farm near Holt, MN, and to this union nine children were born: Bob, Delmer, Wayne, Roanne, Rolly, Tracy, Leyton, Kim, and Scott. For many years, she was a hard working stay at home mom who raised the kids as well as helped on the farm. Later on, she was employed at The Mint Café, Pat’s Café, Fountain Café, and Best Western; she retired at the age of 60. 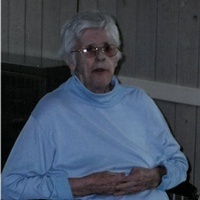 Myrtle enjoyed traveling and visiting with friends, and playing whist and bingo at the Care Center. In 1965, Lester passed away. She later married Sam Lindsay, and they made their home in Thief River Falls. A few years later, she was united in marriage to Marcus Hickey, and together made their home between Thief River Falls and Texas. Myrtle is survived by her six children Bob Torkelson of San Francisco, CA, Roanne “Kookie” (Richard) Hawk, Rolly Milks, Tracy (Joe) Pueringer all of Thief River Falls, MN, Leyton (Sue) Rodahl of Minneapolis, MN, Scott (Robyn) Rodahl of Crookston; numerous grandchildren, great-grandchildren and great-great grandchildren; and many other relatives and friends. She is preceded in death by her parents; husband, Lester; siblings, Cyril and Cecil (twins), Richard, Enid, and Irene; children, Delmer, Wayne, and Kim; and grandson, Delmer.